for exploring the area while also keeping fit. In addition to multi-lane cross-country skiing trails in the middle of the valley, you will also find more remote trails for exciting journeys of discovery with the family. Night-time cross-country skiing trail In the Ried cross-country skiing stadium, a floodlit facility offers cross-country skiing fun after dark. The 2 km night-time trail is illuminated three times a week (Tuesday, Wednesday and Friday) from sunset until 8 p.m.
1. 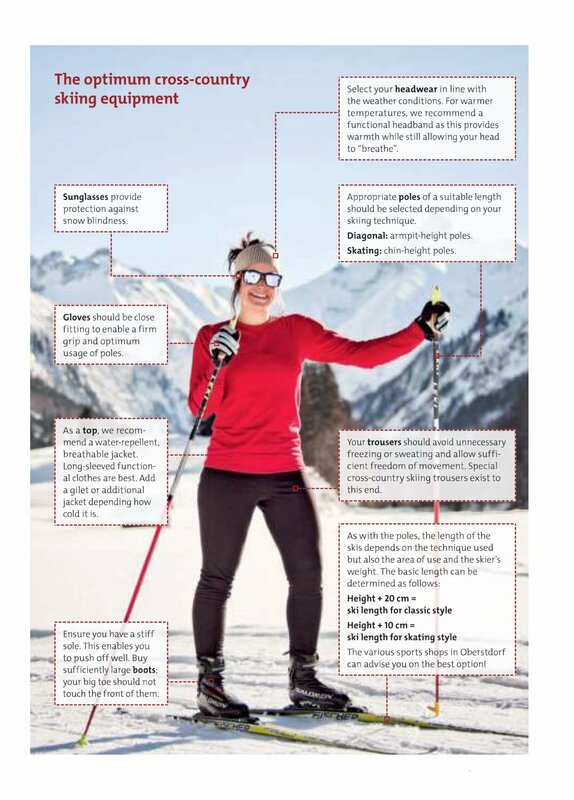 As a sport, cross-country skiing is particularly good for you as it uses many different muscle groups. It is kind on the joints and not only works the leg and core muscles but also the often neglected shoulders and arms. 2. By alternating between skating and classic style, you will activate even more muscle groups. 3. You furthermore stimulate your metabolism, strengthen your immune system and activate fat burning. 4. 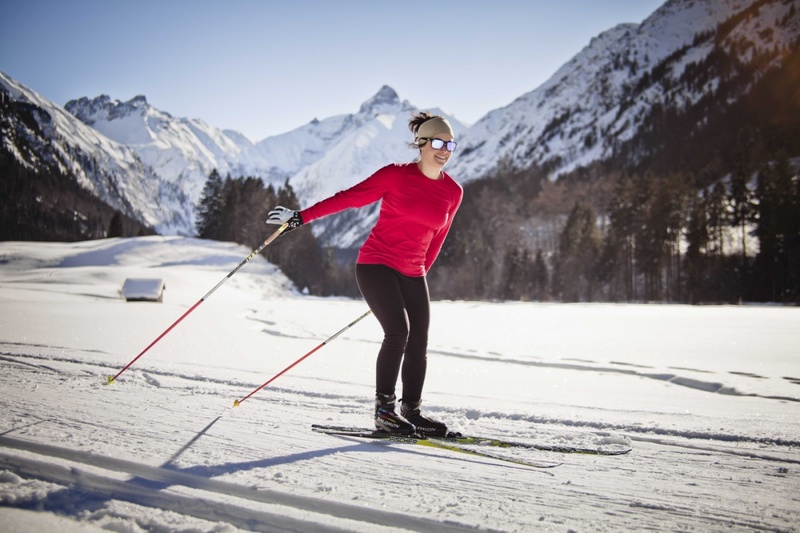 Cross-country skiing not only boosts your endurance but also requires good balance and helps to improve this. 5. Cross-country skiing is also great for your coordination. You learn to move dynamically and economically – while enjoying the exercise of course. 6. 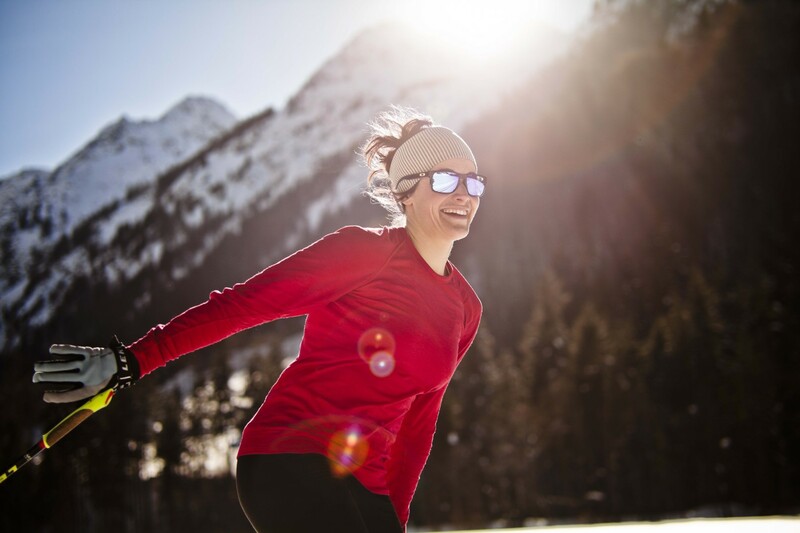 Exercising outdoors in the cold, in the natural winter landscape has great physiological benefits. 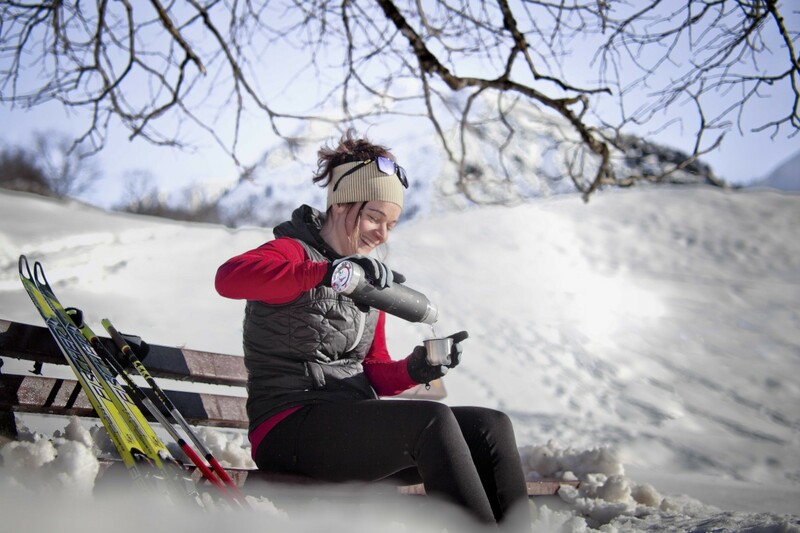 Anyone who is stressed and yearns to relax and recuperate should try cross-country skiing. The constant movement rhythm through a peaceful wintry landscape calms the nerves and clears the head. 7. It helps the cardiovascular system. 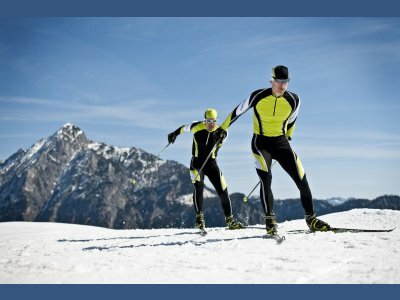 If you cross-country ski to a certain extent, you will also note an improvement in your strength and endurance. Special offer: book 7 nights - pay for 6 or receive 15% discount on the regular price! 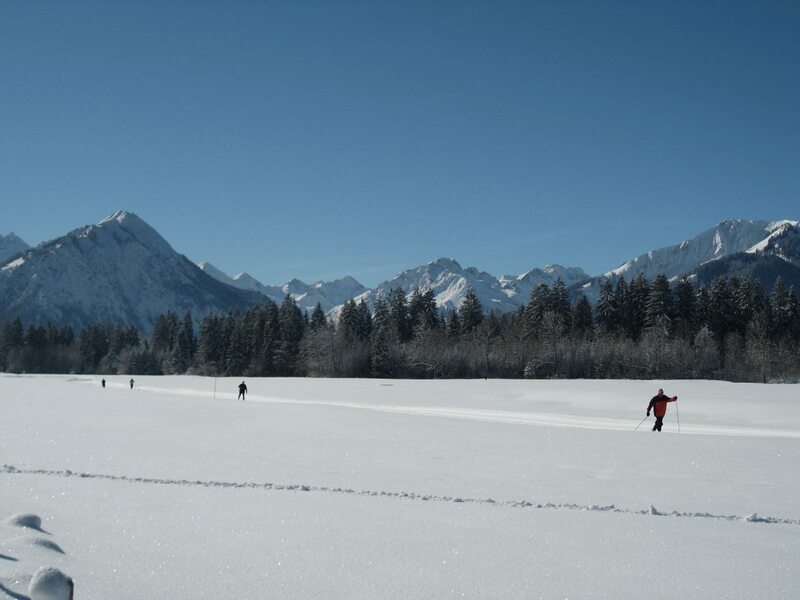 We have selected three cross-country skiing trails to tell you about in more detail. The Otterrohr circular trail is located at the north-western edge of Oberstdorf. In the north and west, the cross-country skiing trails run parallel to the present-day course of the Stillach River. Unlike many other cross-country skiing trails, these are largely protected from the wind thanks to the surrounding peaks. Their location also means that if the weather is good, plenty of sunshine is guaranteed on them. The largely flat cross-country skiing trails are particularly popular with beginners. In summer, the agricultural land is now primarily used for haymaking or as pastures. In past times, the originally marshy straw meadows along the Stillach River bend were used as arable land for many years. It is no longer possible to determine whether the area got its current name from its former owners or due to the otters that lived here. For about half of the circular trail, it is possible to return to the start via a shorter loop. The longer version takes a varied route through an untouched winter landscape and heavily snow-covered mountain forests to the Aibele Alpe. Here, the trail cuts an idyllic arc around the alpine hut, which is located on the territory of the market community of Oberstdorf but managed from the neighbouring Bregenzerwald region. The return route runs along the opposite side of the valley, undulating as it goes and offering several beautiful views of the gentle mountain ridge of the Piesenkopf to the north. On returning to the Rohrmoos mountain restaurant, do not miss the chance for a brief look inside one of Germany’s oldest wooden chapels before you do the inevitable of rewarding yourself for all your hard work! In winter, the only way to get to the Rohrmoostal Valley is via a private toll road! There is no bus line. You should therefore take approx. € 5.00 (in coins) with you for the toll charge. In view of its long overall length, this cross-country skiing trail should not be underestimated. However, it can be shortened after a loop in the Rubinger Oy or when near Reichenbach. With stunning scenery, options to stop for a break at cosy, nearby eateries and idyllic villages, the circular route is a true gem of the Oberstdorf trail network! Due to the exposed terrain, the minimum snow depth required for machine-based grooming is not always achieved. As a result, it is not always possible to use this cross-country skiing trail – including out of consideration of the farmers and land owners. After passing the “Widum”, the trail leads below the Schöllang mountain church and its Herrenholz hill back to Reichenbach. The subsequent descents to Rubi once again offer particularly spectacular views: all the way from the Oberstdorf Basin to far into the Kleinwalsertal Valley. 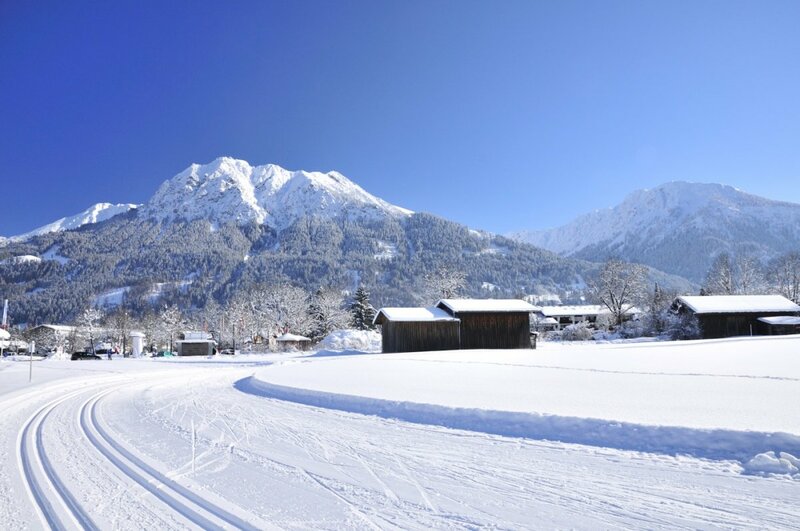 More athletic cross-country skiers will again be completely in their element here before the trail finishes with a flat section along the Rubinger Oy towards Oberstdorf. 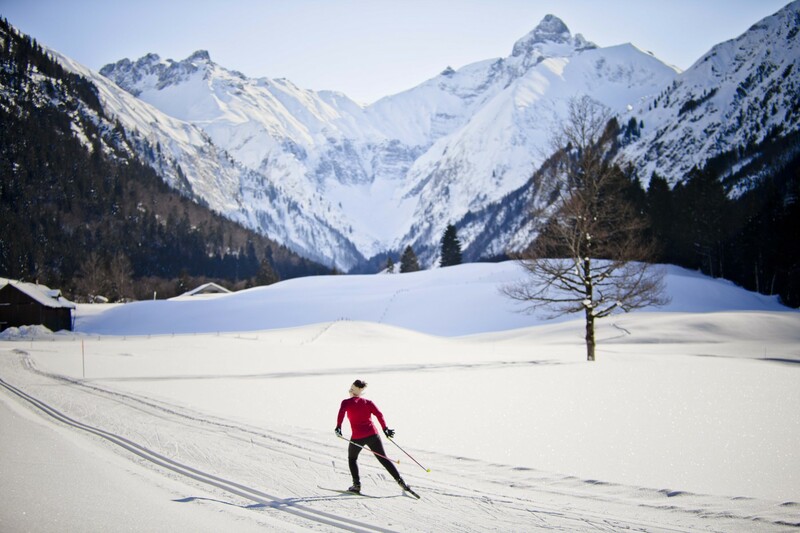 By taking the skiing trail in Karweidach, you can switch to the cross-country skiing trail in Otterrohr. Want more cross-country skiing trails? (advance booking prior to arrival not possible). Public transport is available to and from the stadium! The taster lesson for visitors and locals. Shooting will occur using laser guns over a 10 m distance, from both a standing and a lying position. A realistic biathlon experience for all! 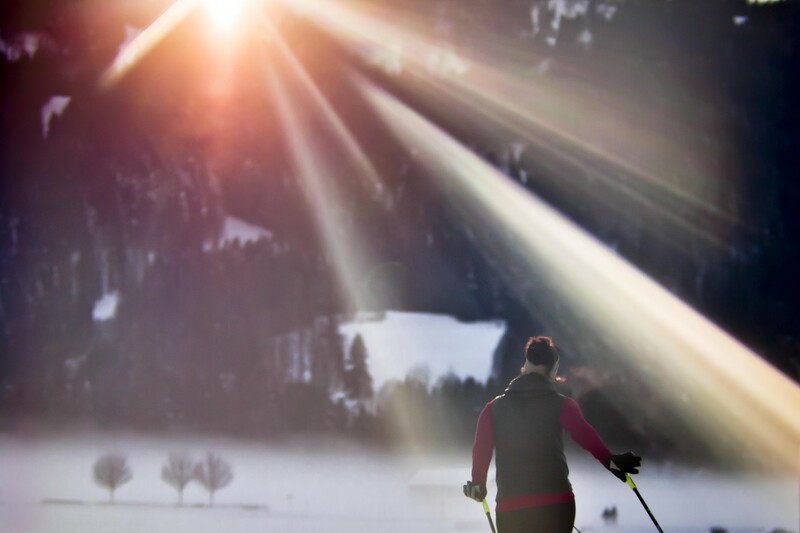 The taster course is held once a week in the Ried cross-country skiing stadium from about mid-December to early April, depending on snow levels. 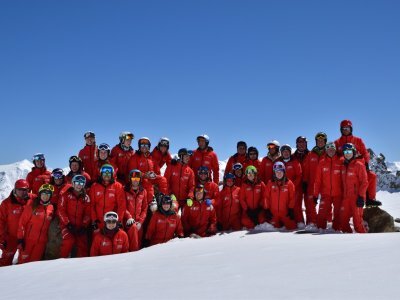 The price includes skating equipment and gun hire as well as professional instruction. Erleben Sie die Faszination Nordic auf den WM-Loipen von Oberstdorf! 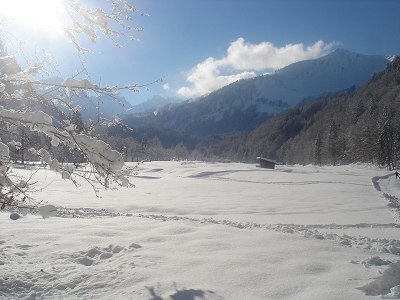 The perfect cross-country skiing day in Oberstdorf ..